In 1961, the Fender Electric Instrument Manufacturing Company released a complex variation on the tremolo effect known commonly as harmonic vibrato. While not technically vibrato (frequency modulation), this new take on tremolo created an effect vaguely reminiscent of a rotating speaker. Due to it's complexity and cost, this form of tremolo was short lived, and no adequate substitute existed - until now. 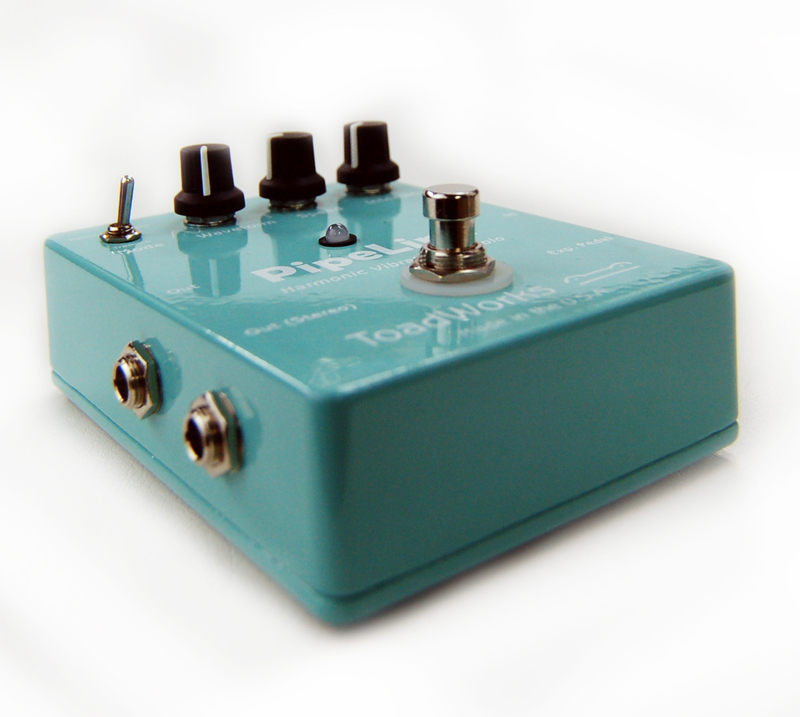 In January 2009, ToadWorks USA began development on a pedal that would accurately replicate the harmonic vibrato, and in December of 2009 it was completed. 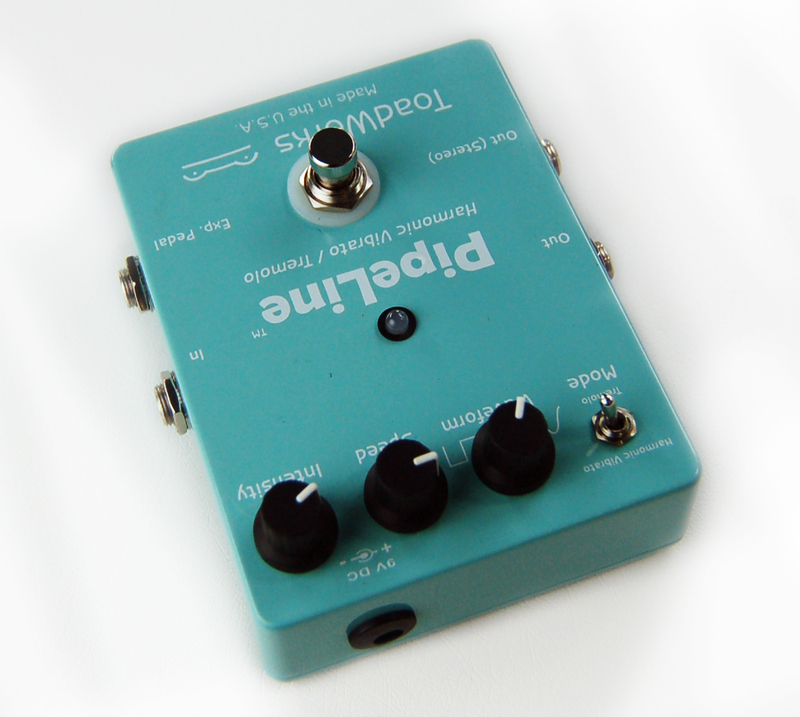 Not content to simply duplicate this functionality, ToadWorks USA has created a stereo version of this unique effect that is also capable of standard tremolo effect as well. With the addition of a low-pass frequency trim adjustment and expression pedal control, ToadWorks has taken Tremolo to the next level. The key to the harmonic vibrato is a combination of high and low-pass filters applied to alternating (out or phase) modulated signals. 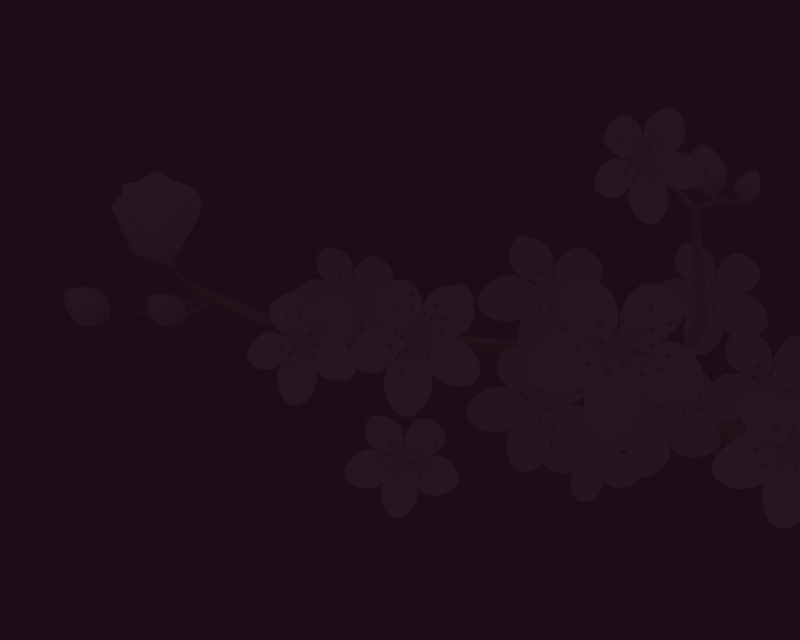 The result is something that cannot be adequately described, it must be heard to be fully appreciated. As with all ToadWorks effect pedals, PipeLine is wired for true-bypass. PipeLine is hand wired, by people, not machines. From our high quality 3PDT switches to the custom made enclosures and knobs, each component is the finest available, making ToadWorks pedals the most well-built and reliable effect pedals in the world. 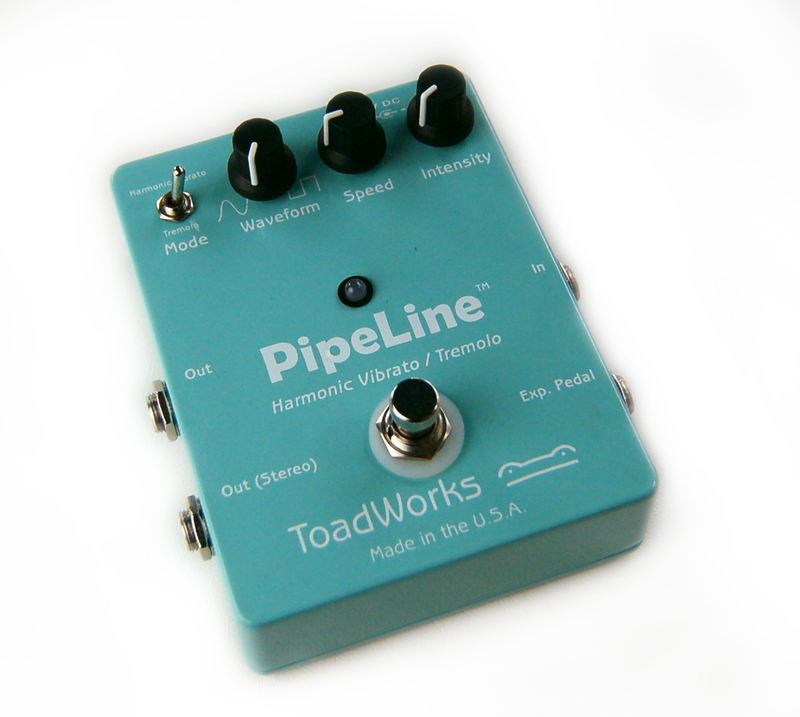 ToadWorks PipeLine is more than just a tremolo pedal, it is the end result of 60 years of tremolo design. One of the most significant improvements to the standard tremolo and harmonic vibrato modes is the stereo output. When used in mono mode, the primary output jack provides standard trem sounds. Inserting a plug into the bottom output jack splits the signal for stereo reproduction, creating a alternating aural phenomenon that cannot be duplicated with a mono sound source. PipeLine is designed for use with an Expression Pedal - Connecting the Expression Pedal to the Exp. 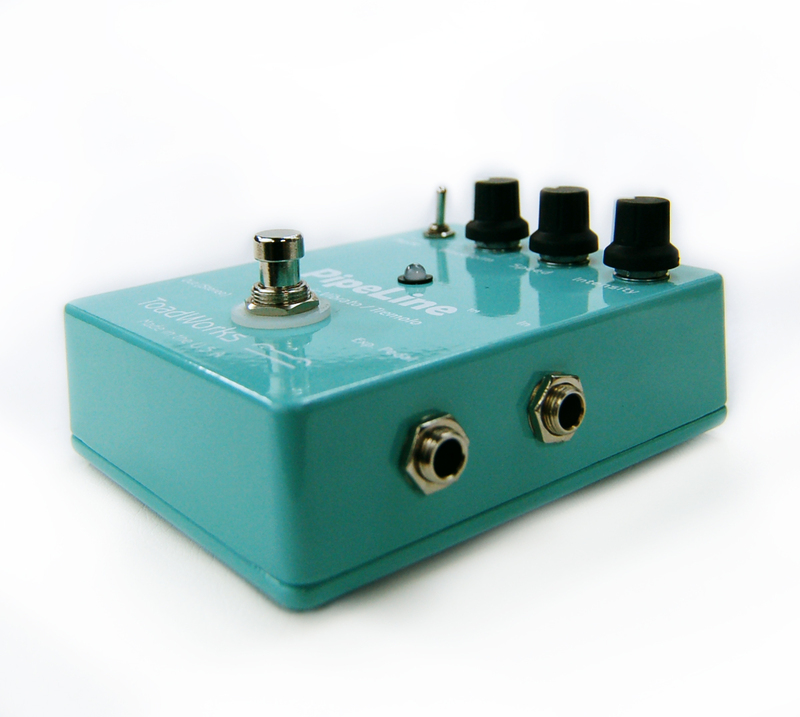 Pedal jack will disable the Speed control, and the expression pedal becomes the manual speed controller. 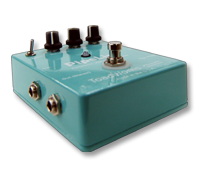 For the best operation, ToadWorks recommends the Mission EP1-TB Expression Pedal. The switch turns the effect on and off, the toggle switch selects between normal tremolo and harmonic vibrato modes. The waveform knob adjusts the shape of the LFO - to left is a smooth sine wave, to the right is a clipped square wave. The Speed knob controls the LFO rate, and the Intensity knob controls the amount of effect present in the signal. There's even an internal trimmer to adjust the low-pass cutoff frequency. PipeLine features a true-bypass circuit, keeping your tone crystal clear when bypassed. Each pedal is carefully manufactured by hand, using only the finest components. Expression Pedal Mission EP1-TB - Click here to get it!